The 3rd Grade did this project called “Landscape in Oil Pastel.” We took pictures of the class working on this project and you can see that they are busy. We used oil pastels on black construction paper. This project takes time because it’s very important to really fill in with the oil pastels so the picture is bright and bold. 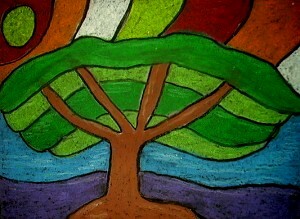 More info on this project, “Landscape in Oil Pastel,” can be found in the 3rd Grade Projects Gallery in the sidebar. This entry was posted in 3rd Grade and tagged 3rd Grade, art projects for kids, classroom art projects, easy oil pastel art for kids, landscape in oil pastel, oil pastel art projects for kids, oil pastels. Bookmark the permalink.